Good news everyone, today is National Spanish Paella Day! Why do we have a day devoted to a dish, you ask? I don’t know, but it gives me an excuse to eat well for a change, so I’m happy. Today I’m going to give you a recipe so you can join me in celebrating this auspicious day. The recipe has been provided by A Fare Extraordinaire, one of our events caterers, so it’s sure to produce delicious fare. Before we get to the recipe, though, I thought I’d share a couple interesting facts about pealla. Did you know that paella means “pan” in the Valencian dialect? Valencia is a region (formally a distinct kingdom) of Spain centered around the city of Valencia, and although they speak Spanish, they speak it with their own flavor and unique word usage. 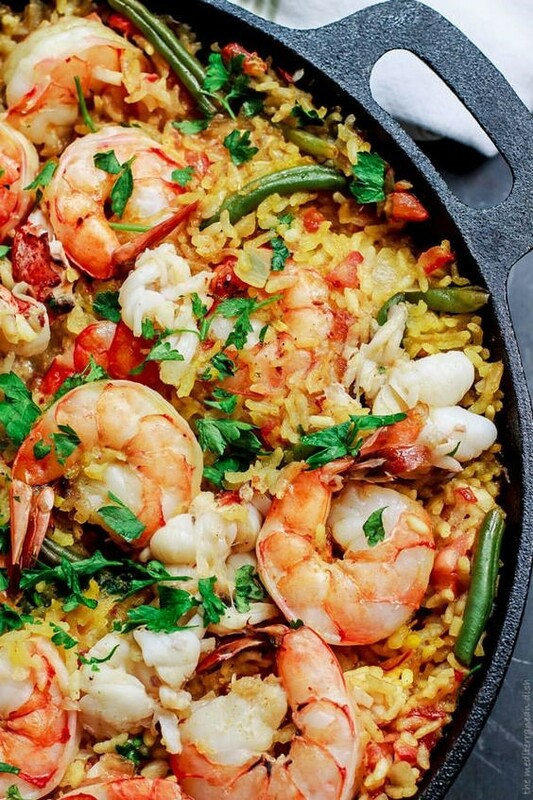 Paella was invented near the city of Valencia in the 19th century and was named after the way the dish was originally cooked: in a pan over an open flame. Although the concept of Paella as we know it today was invented in the 19th century, the dish can trace it’s roots all the way back to Moorish rule. The Muslim rulers first cultivated rice in the Iberian Peninsula in the 8th to the 10th centuries, ever since the crop has had an influence on Spanish cuisine. An now, without further adeu, here is your recipe. Heat the chicken stock and seafood stock in a medium saucepot over medium heat. Add the saffron then bring to a simmer for about 10 minutes. Heat a 16-inch paella pan or large enameled cast-iron casserole dish over medium heat, add the olive oil and heat through. Add the onion and sauté, stirring occasionally, until tender, about 5 minutes. Add the garlic, tomato and paprika and cook for an additional minute, stirring constantly. Add the rice and stir to coat in the oil, letting it cook for about a minute. Add the warmed stock and stir to combine and evenly spread the rice out in the pan. Cook, without stirring, but rotating the pan frequently, until half the liquid has been absorbed, about 15 minutes. Reduce the heat to medium-low then nestle the chorizo and shrimp into the rice. Cover with aluminum foil and cook for 5 minutes. Add the mussels and clams with the hinge-side down as well as the peas. Cover again and cook until the clams and mussels open, about and additional 8 minutes. Remove from heat and let stand an additional 10 minutes. Garnish with parsley and lemon then serve immediately. Oh my goodness I love paella and just recently got brave enough to try making it… labor intensive but not nearly as hard as I expected. I can’t wait to try this recipe! Thanks for sharing! Next Post Wait Just A Minute! Let's Take A Second To Talk About the Origin Of Time Keeping.